Allspice, also known popularly as Jamaican pepper or pimento, is one of the widely used spices in the Mexican and other Central American cuisines. This spice corn is a dried "unripe" fruit obtained from an evergreen tropical shrub belonging to the Myrtle (Myrtaceae) family, of the genus: pimento. The pimento tree is native to the tropical evergreen rainforest of the Central American region and Caribbean islands. It begins yield after about five years of implantation. Unripe green berries picked up from the tree when they reach full size. They are then thoroughly subjected to dry under sunlight. Thus shriveled berries appear similar to that of brown peppercorns, and measure about 6 mm in diameter. 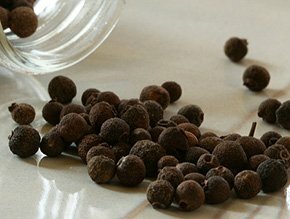 Unlike in peppercorns which have only one centrally placed seed, allspice contains two seeds. Ground allspice features sharp spicy bite and aroma that closely resemble a mixture of black-pepper, nutmeg, cloves, and cinnamon. The spice composes good amount of minerals like potassium, manganese, iron, copper, selenium, and magnesium. Iron is an essential co-factor for cytochrome oxidase enzyme during cellular metabolism. Iron is also required for red blood cell production in the bone marrow. Potassium, being an important component of cell and body fluids, helps regulate heart rate and blood pressure. Manganese is utilized in the human body as a co-factor for the antioxidant enzyme, superoxide dismutase. Allspice nutrition profile-Pimenta dioica, Nutrition value per 100g. Allspice corns can be available year around. In the stores, buy whole allspice corns instead of ground (powder), since, often it may contain adulterated spicy powders. Look for the pimentos that feature wholesome, heavy, round and compact. The pimento corns can be stored at room temperature for many months and milled as and when required. Once ground or powdered, pimento should be kept in the refrigerator in airtight containers and should be used as early as possible before it loses its flavor; largely because of the evaporation of essential oils. To keep fragrance and flavor, allspice should be ground just before preparing dishes and added to the cooking recipes in the final stages. 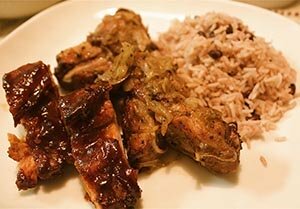 Jamaican jerk spice-rub chicken with sauce. Pimentocorns widely used in the Caribbean cuisine. In Jamaica, along with the scotch bonnet peppers, they are one of the two main ingredients in popular Jamaican jerk spice. Along with other complementing spices, its mixture (paste) is being used to rub, and to marinate chicken, fish, and meat. Some Indian vegetarian and chicken curries found extensive use of this spice. In the Middle East, it employed in meat and rice dishes. The spice has also used in the preparation of soups, barbecue sauces, pickling and as a main ingredient in a variety of curry powders. It also employed to prepare liquors in many Caribbean countries. A kind of local drink known as Jamaican dram made from using allspice. The essential oil, eugenol derived from the allspice berry has been in therapeutic use in dentistry as a local anesthetic and antiseptic for teeth and gum. A kind of decoction obtained from this spice sometimes used in treating flatulence and indigestion in traditional medicine. However, there is little or no scientific data to support such claims. The essential volatile oils in the pimento spice work as a rubefacient, (meaning that it irritates local skin area and expands blood vessels resulting in increasing blood flow to make skin feel warmer). Its oil is a popular home remedy for arthritis and sore muscles, used either as a poultice or in hot baths. (Medical disclaimer). Allspice may cause severe allergic reactions in hypersensitive individuals and, therefore, should be avoided whenever warranted. Consumption of dishes prepared with excess spice can cause gastrointestinal irritation, central nervous system depression, seizures (in toxic doses). Furthermore, individuals suffering from stomach ulcers, ulcerative colitis, and diverticulitis conditions should avoid recipes made usin this spice. (Medical disclaimer). <<-Back to Spices from Allspice nutrition. Visit here for an impressive list of healthy spices with complete illustrations of their nutrition facts and health benefits.